What are the details of the runways of Philip Goldson Airport and it’s history? Philip S. W. Goldson International Airport , (PGIA) is the premier international airport of Belize. Located only 10 miles from Belize City, the airport serves as the main gateway to this beautiful, developing nation. The airport facilitates both international and domestic air services. It is served by several international airlines with originating services from the USA, Central America and the Caribbean. Locally, passengers can arrive at their final destination by way of local airlines, taxi cabs, buses and water taxis.The airport was originally constructed in 1943, when a 5,000 feet asphalt runway, a taxiway and small apron were constructed. In 1944, a terminal building was constructed and inaugurated on January 15, 1945. The airport derived its name from the name of Belize politician Philip Stanley Wilberforce Goldson. Today, the PGIA boasts a 7,100 feet runway and 615,800 sq. ft. of parking apron. There is a full Crash Fire and Rescue Department and the airport is designated as a Category 8 in accordance with ICAO Annex 14. Expansion of the runway and apron to accomodate widebody, longer haul aircraft is in progress. < The IATA Code of Philip SW Goldson International Airport is BZE and the ICAO Code is MZBZ. This airport has a plan to expand its runway length, terminals, etc. by 2015. Philip SW Goldson International Airport is very attractive and has an excellent interior decoration. The airport features shops, restaurant, bar, etc. Several major airlines have daily direct flights from the United States and Central American gateways. All coordinated with European and Canadian connections to land at the Philip Goldson International Airport (PGIA) in Ladyville, which is 20 minutes away from Belize City. Connecting flights and land transfers from Guatemala, Cancun (Mexico) and other Central American countries can be arranged via regional and local airlines and bus companies. Philip SW Goldson International Airport is the busiest airport of Belize. Philip S. W. Goldson International Airport (IATA: BZE , ICAO: MZBZ ) is an airport that serves Belize’s largest city, Belize City. It was named for now-deceased politician Phillip Stanley Wilberforce Goldson. The airport will be going through major expansions such as the lengthening of the runway, expanding of the apron and expansion of the terminal. These expansions are made mainly to handle more planes and for the airport to bring in flights from Europe. The expansions are planned to be completed in time for 2015. Philip S. W. Goldson is at an altitude of 5 metres and this means that both the airport and the entirety of Belize City are at risk of serious flooding due to its low elevation and coastal location. 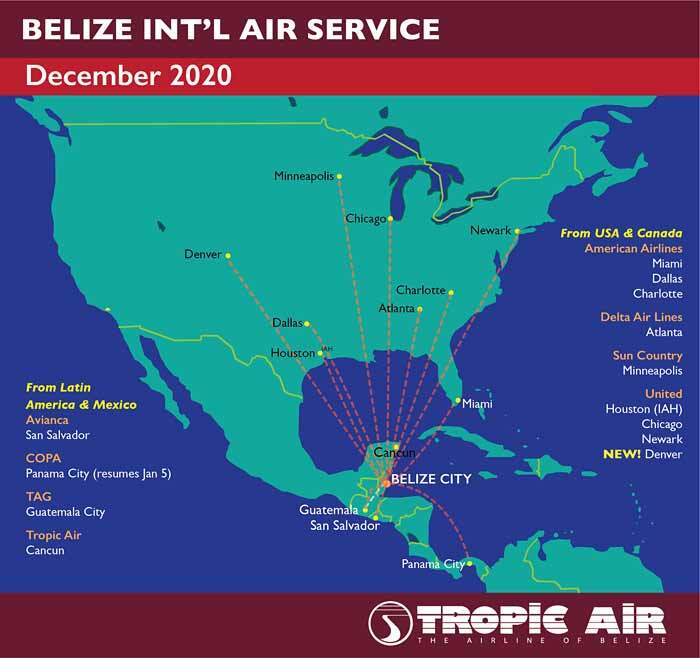 For this reason, Belize’s capital has been moved to Belmopan, but Philip S. W. Goldson International Airport remains the largest and busiest in the country. Philip S. W. Goldson is about 30 minutes drive from Belize City’s centre, in Ladyville. The best way to get to and from the city centre is via taxi. Although an airport bus service exists, it is very infrequent and unreliable. Airport information for MZBZ at World Aero Data. The PGIA is equipped with three (3) taxiways designated as Alpha, Bravo and Charlie. All three taxiways are 75 feet wide. Alpha is 2,740 feet in length with 25 feet wide non-load bearing shoulders, while Bravo and Charlie are 484 feet long with no shoulders. The parking apron at the PGIA is 615,800 sq. ft. with a declared strength of 86 LCN. There are 7 parking slots available for nose-in parking. A 5,000 feet runway was built and an Airport Terminal Building was completed in 1945. The airport was named after Sir Oliver Stanley, the Secretary of State for the Colonies. It was called Stanley Field. Modification of the Terminal Building was done and included the renovation of the Air Traffic Control Tower on the top of the Building. The Canadian Government through the Canadian International Development Agency (CIDA) constructed a Control Tower intended to serve the airport for three to five years. This was constructed at an area away from the Terminal Building. A Control Tower on top of the Terminal Building was rebuilt by the Government of Belize. With the opening of the New Terminal Building, Air Traffic Control was provided through a new Air Traffic Control Tower. The equipment in the Tower was a brand new French communications system. After some years of use the equipment became obsolete and COCESNA through its modernization program for its Member States (of which Belize is a Member), replaced the communications systems with more modern ones. The Air Traffic Control Tower’s voice communication system was modernized. The radio navigational aid - Doppler Very High Frequency Omni-directional Radio Range collocated with a Distance Measuring Equipment (DVOR/DME) was modernized. A new Approach Control Centre was built together with the installation of a brand new state of the art Monopulse Secondary Surveillance RADAR for the enhancement and increased management of Belize’s airspace. A new radio navigational aid - Instrument Landing System collocated with its Distance Measuring Equipment (ILS/DME) was installed. Posted : Marty Casado - Thu, May 12, 2011 11:33 AM. This article has been viewed 31018 times. What is the duty on bottles of wine over and above the duty free limit? What can you tell me about the history of Ambergris Caye and San Pedro? Is WIFI available at The Belize International Airport? Do you have some biographical information on the leaders of Belize? What is the origin of the country name Belize? Do you have a list of books about Belize? A bibliography of Belize Books? What is the racial makeup of Belize? What can you tell me about Belize History? What can you tell me about Maya History in Belize? What can you tell me about the history of drilling oil wells in Belize? When was television first introduced to Belize?